Leslie George Peasley, 85, a lifetime Lapeer area resident, died Thursday November 29, 2018. He was born February 6,1933 in Flint to parents George and Ada (Garrett) Peaslee. 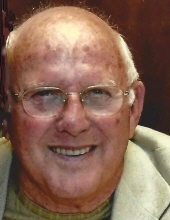 Les served his country in the United States Air Force. In the same general time frame, he married Betty Lou Bliss on May 28, 1954 in Tennessee. Mr. Peasley returned home to work as a press operator and eventually retire from AC Spark Plug/GM. He was a fun, social man; who loved BINGO and cards, especially euchre. His family reflects that Les was honestly one of the best, most loving grandfathers. Above all else, he truly loved his family. The family would like to extend a sincere thank you to the staff of the Pines of Lapeer Assisted Living, for the wonderful care they gave Les. Mr. Peasley is survived by his children: Cindy (John) Lincoln of Chicago, Dave (Karen) Peasley of Lapeer, Brad (Michele) Peasley of Lapeer, grandchildren: Courtney (Kyle), Brandon (Amanda), Alex, Rebecca, Joey, Tommy, great-grandchildren: Remington, Hailey and Madeline. Mr. Peasley was preceded in death by his wife: Betty in 2014, three sisters as well as his parents. Visitation will be 3-7pm Sunday at Muir Brothers Funeral Home, Lapeer. Les' funeral will be held 11:00am Monday December 3, 2018 at the funeral home, officiated by Pastor Drew Jolly. Burial to follow, in Stiles Cemetery, Lapeer. Memorial contributions may be made to the Alzheimer’s Association or the Lapeer Independent Order of the Oddfellows. Condolences and memories may be left at MuirBrothersLapeer.com. "Email Address" would like to share the life celebration of Leslie George Peasley. Click on the "link" to go to share a favorite memory or leave a condolence message for the family.